is it possible to loop a song from a different pattern than the one it starts with? image for reference if my question doesn't make any sense. sorry if this is a stupid question, but i can't find any information on this. 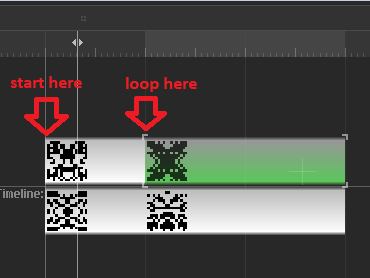 Select all, drag the entire song to the left to sync 'loop here' with line 0. Set the playback cursor to the beginning of the song (in negative time) and press play (not play from beginning). The song will play from minus something to the end and loop back to line 0. In this very case, just select the first pattern and press F11/Play pattern.